I'm back!!! I've missed you, friends and I have about 2000 pictures to post! 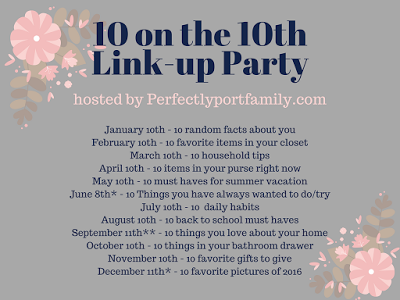 But for today, I'm linking up with Erin for the 10th day of the month to talk 10 daily habits. 2- I take vitamins every day but I'm picky about them since I'm not a fan of irradiation. I take a multi-vitamin for active women, magnesium, b complex and cod liver oil. 3- My kids and I pray on the way to school. A gets really into it and prays for all these random people and things. 4- I workout every weekday and sometimes on weekends but mostly on mornings. I like to get it out of the way. 5- I eat almost right after working out--- Someone told me that the hour right after you workout, it's important to eat and that's stuck with me. Also because I am STARVING! 6- I usually make dinner when no one is home so when they come home I can spend time with them. I put on some netflix and it makes prep and cleaning just fly by. 7- I try to run an errand right when I pick up C but before I go for A. Girlfriend likes to stay in her school until the very end!! 8- I work after lunch, before picking up my kids, for a bit in the afternoon and when D comes home at night. 9- I check my fitbit and my iphone all the time. I'm not one of those unplugged people. 10- I usually pack my kids' lunches and sometimes D's the night before. I'm way more creative the night before than a bleary eyed morning. Alarms stress me out too! Russ' went off a bit ago and it was so dang loud I grabbed my chest because I was terrified. He and I are going to have to talk about that. I definitely make lunches the night before too! That praying on the way to school routine is soooo sweet. Love that your daughter gets into it. Absolutely love that! I'm not an unplug person, either! okay the fact that you don't need an alarm, holy cow I would be late to work everyday! I love the praying on the way to school, such a cool way to talk in the morning and make it intentional. I need an alarm, but hate the snooze button. My roommates in college would hit snooze for an hour...why not just set it for an hour later each day and get up then? I love the praying on the way to school. What a positive way to start each day and a peaceful way too. I am a night-before-lunch-packer too. Have a great start to your day! I love that you work out so much! That's great! And I'm with you, if I have to make lunches I prefer to make them in the evening. Preferably when I already have the dinner mess still out.